in some of Tolkien's LOTR books and writings. We will see if they are occultic, or not. one of the Istari, and more. Many have researched into occult aspects of various books and movies. Some have pointed out actual witchcraft portrayed for entertainment in fictional books and movies, such as Star Wars and Harry Potter. The occult world is very active in these days in which we live. But, are J.R.R. Tolkien’s Lord of the Rings novels free of anything occultic? Or, do they include occult themes and symbols? 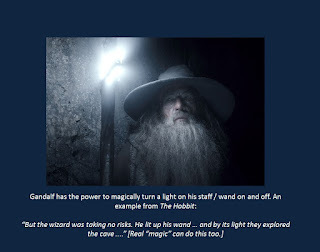 Tolkien described Gandalf (and the other the Istari wizards) as having a physical body that suffers from weariness and pain, but that is controlled by an angelic spirit. Thus, Gandalf was an “incarnate angel”. Half man, half angel creatures are found in Genesis chapter 6.
" And it came to pass, when men began to multiply on the face of the earth, and daughters were born unto them,  That the sons of God saw the daughters of men that they were fair; and they took them wives of all which they chose. And the LORD said, My spirit shall not always strive with man, for that he also is flesh: yet his days shall be an hundred and twenty years. There were giants in the earth in those days; and also after that, when the sons of God came in unto the daughters of men, and they bare children to them, the same became mighty men which were of old, men of renown. 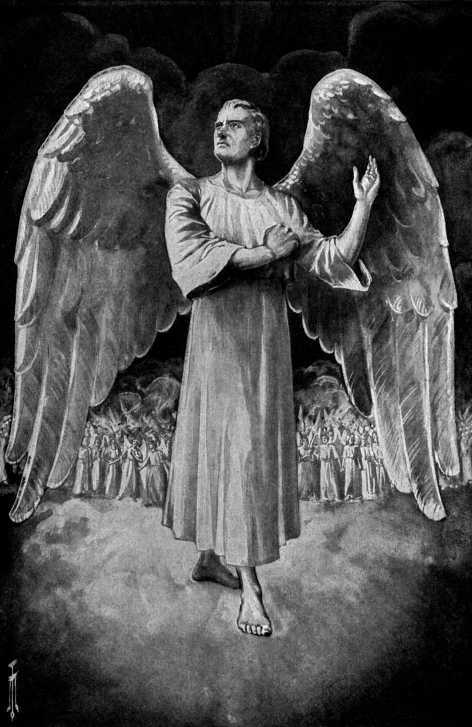 The phrase “sons of God” was used in the book of Job to refer to angelic beings in Job 1:6. Some of the angels that joined Satan, and rebelled against God, desired to pollute the human race with angel blood to prevent the coming of Jesus Christ, the Messiah. That is why these fallen angels took human women to be their wives. We are living beings because of God breathing us into existence, but a hybrid (man-angel) cannot be given a spirit because it would not be human. God did not create hybrid giants. He created people in His own image. The devil interfered with God’s plan, and that is one of the reasons that God had to destroy the world with a flood (Genesis 6:9-15). But, in addition to the giant hybrids, the wickedness of the pre-flood world was very great. Having a bed 9 cubits in length, this giant, Og, was about 15 feet tall, if we go according to the royal Egyptian cubit (See Endnote 1.). The reason we are looking at Og is to point out that he was not a man with a pituitary disease, which keeps people suffering from Gigantism from living long (See Endnote 2). And, it is almost certain that Og was a hybrid (See Endnote 3). Gandalf was not a giant, but he was what Tolkien would describe as an angel spirit in a human-like body (incarnate angel). 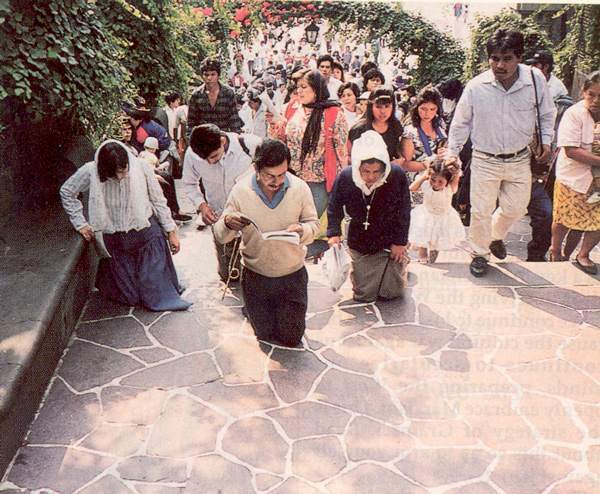 This is very similar to the condition of the Genesis 6 giants, which God had to destroy. Gandalf should, therefore, not be someone you would want your children to read about. In The Fellowship of the Ring, the door of Durin can magically open into the underground world of Moria by speaking a magic word (a.k.a. a spell). It has a special design that J.R.R. Tolkien made for this novel. The design depicts two trees (that slightly resemble vines) wrapped around two pillars. Above the pillars is an arch with elvish writing (a language J.R.R. Tolkien came up with) within. Between the pillars are a large star; a hammer and anvil; a crown; and seven stars. Let’s keep in mind the crown and seven stars as we continue, for they will be significant. 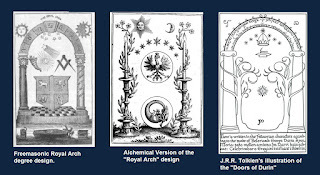 Others have noted the similarity between this Tolkien drawing and a masonic diagram (The Royal Arch tracing board), representing the Royal Arch degree, which also displays seven stars under the signs of the zodiac (occult symbols). In the alchemical version of the “tracing board,” there are two vines wrapped around candlesticks, like the two trees of Tolkien’s diagram. Again, seven stars appear above. 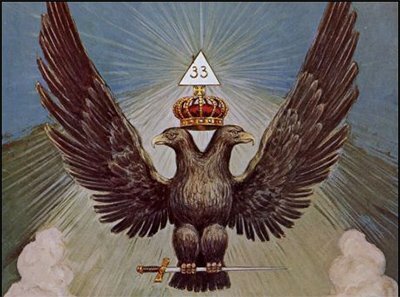 Underneath them is an eagle with a crown, which resembles the position of the crown in Tolkien’s illustration. The summer solstice (indicated by those 7 stars) is an important event for witches. The late David J. Meyer, a former witch, who became a Bible-believing Christian, wrote an article exposing a scene from Prince Caspian (The Chronicles of Narnia) as a “...witches’ sabat of Midsummer or the Summer Solstice...” [E.] [End quote]. The scene in C.S. Lewis’ book had Bacchus (a pagan god of wine and lust) and Maenads (frenzied women) dancing wildly around a bonfire, with Aslan present. 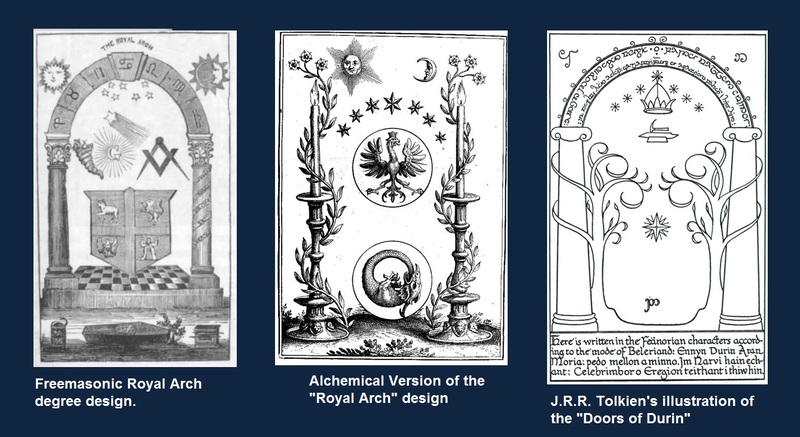 Now, let’s return to Tolkien’s illustration of the “Doors of Durin.” It has a crown with seven stars, like the alchemical design has seven stars over a coronated eagle. 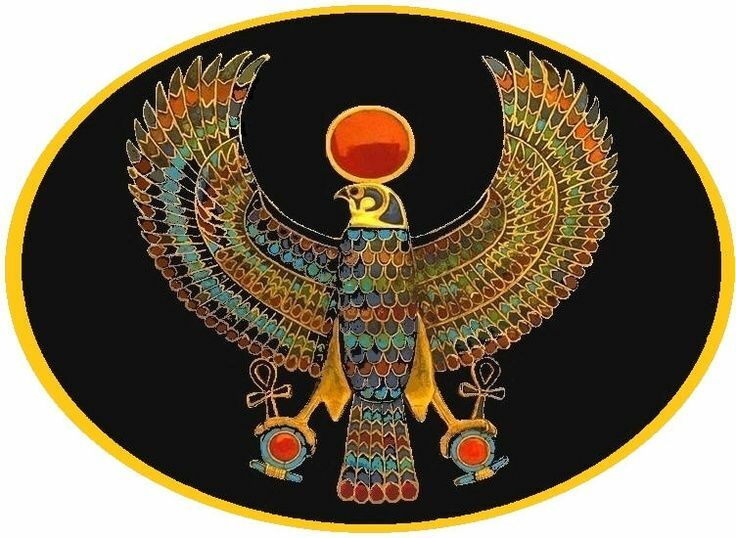 As we saw, the eagle, according to Albert Pike, is a symbol of a sun god. Is is possible that J.R.R. 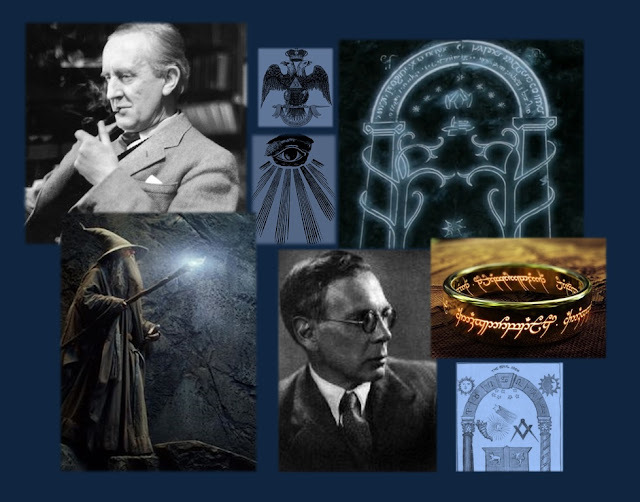 Tolkien was familiar with occult symbols and beliefs? And, did he adapted some of these to his Lord of the Rings novels? Is it possible that Tolkien was promoting the occult through his books? The symbol for the white tree of Gondor, in Peter Jackson’s Lord of the Rings movies, has seven stars, which are supposed to represent the seven stars of the royal House of Elendil (from wikipedia). 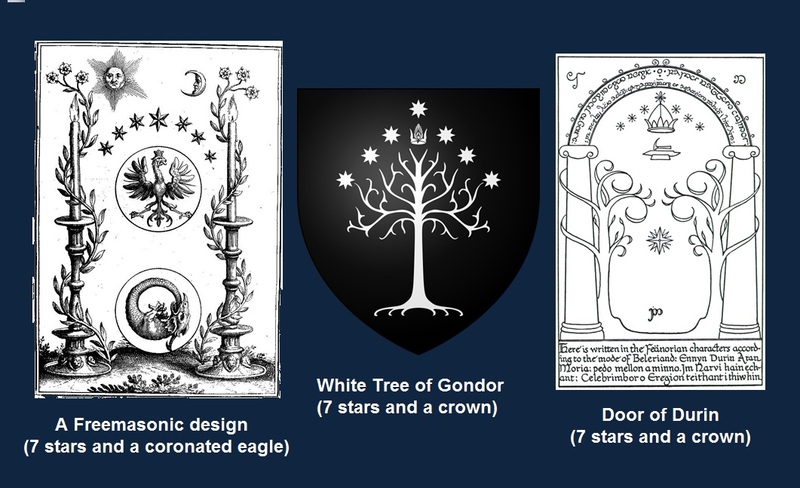 Why would Tolkien have 7 stars and a crown for the dwarves and 7 stars and a crown for Gondor (humans)? Were they actually representing something with a deeper meaning? Therefore, being Catholic, Tolkien was not a true, Bible-believing Christian. We know that he was fascinated with the occult and pagan mythology. Other stories Charles Williams wrote include necromancy (supposedly speaking to spirits of the dead); black magic to contact spirits; occult powers; ghosts; and other occult topics. All of this God forbids in Deuteronomy 18:9-14 and throughout the Bible. Could J.R.R. Tolkien, who had friendships with occultists, who was a devout Catholic, who was fascinated with the occult and paganism, produce novels that are spiritually edifying and godly? Should a Christian read such novels? By looking at Tolkien’s fruit, we can see that he did not bear the fruit of a true Christian or of a godly man. Getting to Know God as Our Best Friend Is the Answer to the World’s Ways and Temptation. God calls us Christians to come out of the world, and be separate from its ungodly ways (2 Corinthians 6:14-18). 2 Corinthians 6:17-18 — " Wherefore come out from among them, and be ye separate, saith the Lord, and touch not the unclean thing; and I will receive you,  And will be a Father unto you, and ye shall be my sons and daughters, saith the Lord Almighty." Getting to know God as our best Friend is the answer to all of life's problems, and is what living is truly all about. Jesus said in John 17:3: "And this is life eternal, that they might know thee the only true God, and Jesus Christ, whom thou hast sent." If you are coming here as a non-Christian, I encourage you to read this. God desires to have fellowship with you, as you make Jesus Christ your Lord and Savior. 1. Moses, the likely writer of Deuteronomy, was raised by the Pharaoh’s daughter (Exodus 2:10) and would have known the Egyptian cubit. 2. The tallest man on record is the late Robert Wadlow, who was 8 ft. 11 in. Og was almost twice Wadlow’s height. Keep in mind that God is faithful to preserve His Word, the Bible (Psalm 12). When God describes a giant that is a little less than 9 cubits (about 15 feet) tall, He means exactly that. Therefore, It is certain that unnaturally tall giants did exist. 3. Genesis 6:4 mentions how (hybrid) giants were produced after the events of Genesis 6. [A.] Tolkien, J.R.R. (Carpenter, Humphrey). "The Letters of J.R.R. Tolkien." books.google.com. [B.] “Freemasonry The worship of Lucifer, SATAN Part 2 of 5.” theforbiddenknowledge.com. [C.] Pike, Albert. "Morals and Dogma : Scottish Rite in Freemasonry." books.google.com. (pg. 108 of 438). [D.] "Royal Arch Tracing Board." taughtbydegree.wordpress.com. [E.] Meyer, David J. "The Witchcraft of the Narnia Chronicles." lasttrumpetministries.org. [F.] “Charles Williams (British writer).” en.wikipedia.org. [G.] “The INKLINGS - Charles Williams.” crossroad.to.